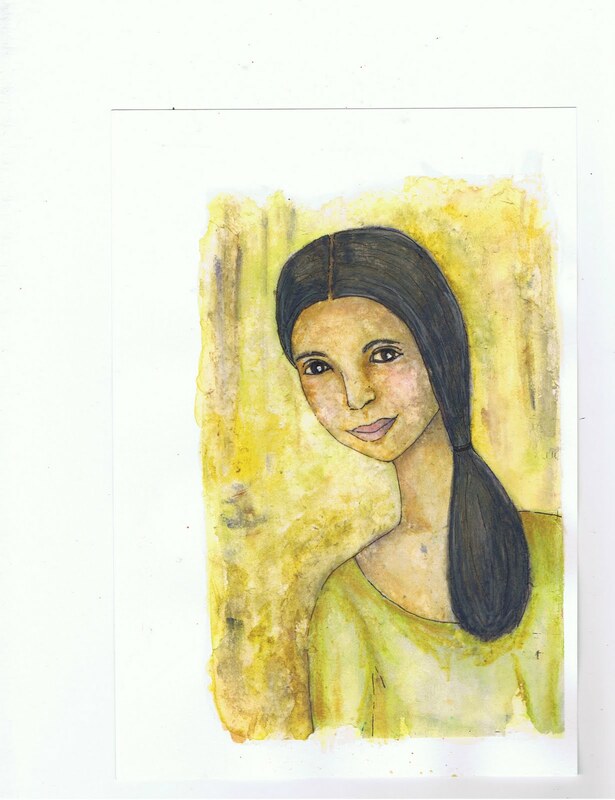 I painted this image a month or so ago.... she was supposed to go on the front of a book I was making. (Her skin looks a bit mottled here it is a bit textured on the painting, but doesn't look as mottled on the original painting.) The book she was supposed to go on still hasn't happened, and now probably won't for a while. I am happy to say that I have finished selling my creations in the 2 sales I went in this year, and that my stock is now very low. I did very well at both sales so that is good - but now I need a break from producing to sell, and some time to create for creating sake. I enjoy doing both of these things, (creating things to sell, and creating just for me and fun) I am just ready to relax for a while. (but wait I can't Christmas is coming) I am in the process of making a Christmas gift, but I can't show that here yet.... maybe after Christmas. All I can say right now is that the project is a lot of fun! I am still without a camera, so don't have much to show you. The above is a scan of another daytimer I am making. It needs to get done tonight, so I better go work on it. The base is two pieces of watercolour paper with a layer of cloth tape inside for strength. 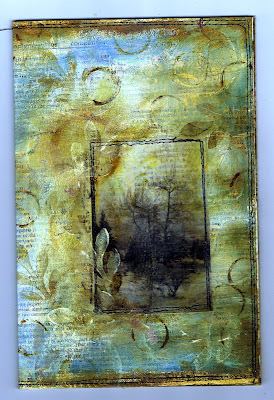 On top of both the inside and outside of the book is a layer of old dictionary pages that are covered in inks and paint. I added an image I printed on vellum to the front cover and sewed it down. THe two pages were then sewn together, and now I need to sew the pages inside. So I better go. It has been a long time since I have posted.... for a number of reasons, but probably best to say I have been very busy, AND my camera is broken, so can't take pictures to share. The above is a scan of a picture I made into a card, and put on the front of a address book I made. 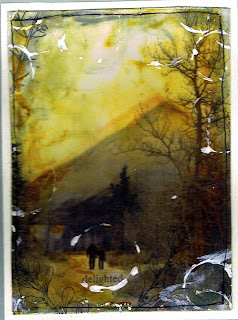 It is a photo I took that I printed in B&W on vellum and then added collage and ink and paint to. I was delighted that I sold so many of my creations at the sale in my hometown but now I don't have very much for a big sale I am doing next weekend. Work and family life have been busy, so have had no more time to create. I do have an hour right now though, so I will try to get a few more cards finished up before busy with family stuff this afternoon. I have finished two day timer agenda books. The face one I made quite some time ago. The yellow one I started some time ago as well, but finished it this morning. The reason it took so long was because I didn't like it. It didn't look anything like it does now. Underneath the final layer is layers of papers with text and flower drawings. Yesterday I painted over the whole thing - inside and out - mucked around in the paint for awhile, let it dry, added an image that I mucked around with some paint, and then sewed it all together. I like it now. Inside I have written the days of the month - by not writing the days of the week, the book can be used for any year. Yesterday I decided to make some boxes/packages that I can package jewelry in at the sales I am attending this month. I realize that this is a bit backwards, as really I should be busy making the jewelry to sell prior to the boxes.... but that is not how my creative pushings seem to work. So... I made some boxes, and decorated them by sewing some material on the top. When you open the box up it has a piece of the matching fabric inside that the necklace will be wrapped in. I knew I couldn't make enough boxes for all the necklaces I have made (or rather hope to finish), so I made 10 of these for some of the necklaces, and for the necklaces that won't get tangled, I made bag like packages. These packages were made out of a page out of a old cookbook (nice heavy paper). I sewed them and tied a ribbon to them. I think both the boxes and the packages will work great..... now I better get busy finishing up the necklaces! My intention was to get lots of pairs of earrings made this week. But life got in the way. Daughter #2 was sick, and then I got sick. I am still not feeling well, but will try to get some of the not creative components of stuff done this afternoon.... the rest of the jewelry making will have to wait for some time and good health. Well, it was back to work day for me today - so not much creating today. Not much creating yesterday either, even though I was at home for the day. Daughter #2 was sick yesterday, and still is today. So spare minutes have been spent with her. The book above is one I made a while ago. 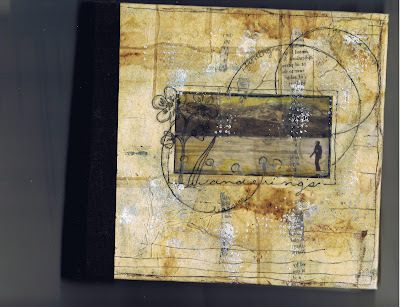 The book is made from used tea bags (dried and washed off of course) overtop some old text. 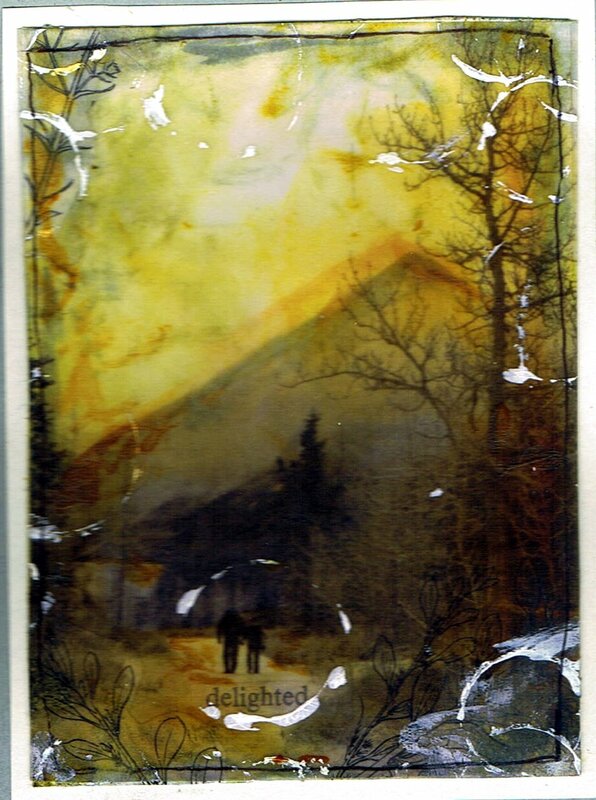 A hand painted picture of daughter #2 walking on the ice of Kluane Lake and drawings are also on the front cover. A thin layer of paste like wax was then rubbed over the whole cover. I am actually working on making some earrings right now... I will try to get some pictures of them on here in the next few days.